Warranty | Perry Hood Properties, Inc.
Perry Hood Properties, Inc. provides all of our new home buyers with a one year builder’s warranty. To make a claim please reference the following steps. Please reference page 6. 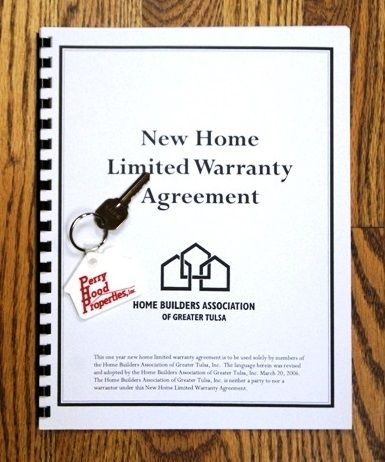 Section C. HOW TO MAKE A CLAIM UNDER THIS WARRANTY of your gray New Home Limited Warranty Agreement booklet provided at closing. If the warranty item qualifies as an emergency as defined on page 47. Section F, call Perry Hood Properties, Inc. directly at (918) 250-2663 if during normal business hours or the appropriate subcontractor directly (contact information listed on hot pink paper provided at closing) after normal business hours. Please place a follow up call to Perry Hood Properties, Inc. corporate office at (918) 250-2663 the next business day during normal business hours to report the emergency after hours call for documentation. Non-emergency item, service will be schedule during normal business hours Monday - Friday from 8:00AM - 4:00PM. You will need to be available and allow access. Please reference page 6. Section C. item 4. Approaching your one year anniversary? It is your responsibility to provide to Perry Hood Properties, Inc. a list of your concerns. This list must be received by Perry Hood Properties, Inc. no later than seven (7) days following the expiration of the one (1) year Warranty period. Please include name, address and best day time contact phone number(s) on all correspondence. Upon receipt of your list you will be contacted with any questions. Please anticipate communication from our corporate office, superintendent(s) and subcontractors. If an item on your list is not a covered item we will let you know at that time. All covered items will be addressed according to the guidelines set forth in the New Home Limited Warranty Agreement booklet signed by both buyer and seller at closing.